The Left Cannot Wait Until the New Congress is Sworn In on the 5th of January to Make Fools of Themselves! Thanks to the Democrats, RINO Republicans, and MSM, America is in a growing state of chaos ten days after the mid-term elections were supposed to be over! It has been ten days since the mid-term election polls closed and we still have undecided federal and state elections, with numerous deadlines being missed and many FEDERAL AND STATE LAWS BEING OPENLY VIOLATED! In a number of these elections, the loser does not have a valid path to victory, but they refuse to concede and continue to have lawyers pile up lawsuit after lawsuit trying to change the election results. We also had elections, like Arizona where the Conservative candidate had a comfortable lead when the polls closed but days later the hard-Left candidate was declared the winner by a comfortable margin. It is interesting to me that in every one of the contested elections the majority of the ballots that were “found” were Democrat! Some ballots are still being “found”! The Democrats in the House of Representatives are in a verbal battle over who will be “Speaker of the House”. The Democrats in the House of Representatives are running in every direction to get in front of TV cameras to talk about what they are going to do in their new role as the majority party in the House of Representatives. 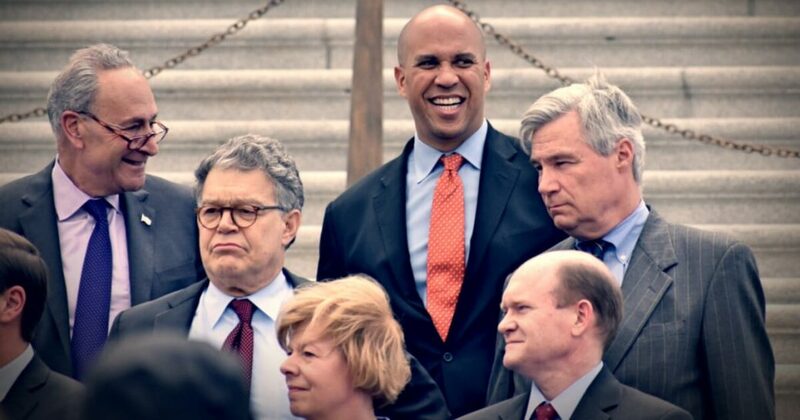 The Democrats in the Senate are running in every direction to get in front of TV cameras to talk about what they are going to do as they work with the Democrat majority in the House of Representatives to “defeat everything Trump”. The Democrats in the Senate seem to have forgotten that the Senate is known as the “upper chamber” for a reason. The Senate can override practically everything the House may try to do, like trying to impeach the President or Judge Kavanaugh. RINO Republican Jeff Flake, who is “retiring”, joined with a Senate Democrat to hold a press conference to announce that he will join with the Democrats to block every judge that is waiting on Senate approval unless Congress passes a bill to “protect” Mueller from President Trump. This is beyond comprehension! Flake is “retiring” because it was obvious to everyone that it was doubtful that he could get re-elected because of his anti-Trump activity during the 2016 elections. RINO Republican Jeff Flake is also getting in front of every TV camera he can find to denigrate the President’s decision to send troops to help the Border Patrol secure our southern border. He is using some of the Democrat’s and MSM’s favorite terms like calling it a “stunt” that is “preventing those troops from spending the holidays with their families” and saying the caravans are not a “threat”. Note to Flake: One part of one caravan is already in Tijuana Mexico trying to get into California to take advantage of the states pro-immigrant policies. If they succeed it will be like the “opening of the floodgates” on a large damn that will rush in the tens of thousands of people in the additional caravans following the illegals already at our border. Representative Adam Schiff is getting in front of every TV camera he can find to talk about all the subpoenas the Democrats are going to issue to “investigate everything Trump”. The phrase that is being used to describe this plan by the MSM is, “the Democrats are loading their subpoena cannon”. Representative Maxine Waters, who does not live in her district, made a public statement that as Chairperson of the House Financial Services Committee, “the days of being easy on banks are over” (whatever that means?). Does she want to recreate the housing market crash that Bill Clinton created by forcing banks to make loans to people who were not eligible for them and could not pay them back? This is the Congress Woman who illegally funneled bank bail-out funds to a minority-owned bank in California that she and her husband owned stock in and her husband was a member of the bank’s Board of Directors. Even though what she did was blatantly illegal the Congressional Ethics committee declined to censor her in any way. Note: The Congressional Ethics Committee has an equal number of Democrat and Republican members virtually assuring that no one in Congress will be censored for anything. It was designed to protect all members of Congress, not to assure that they are ethical. Practically everyone in the MSM loudly and happily talked about how “bitter and withdrawn Trump is over losing the House majority”. While they were doing this President Trump was holding a White House press conference announcing his support for bipartisan legislation that would enact prison reform and criminal sentencing reform to correct some of the serious problems created in our justice system by Bill Clinton’s “three strikes and you are out” legislation. This bill will do a lot to reduce the number of people in our prison system and help many people who do go to jail become productive members of our communities when they get out of jail. President Trump was surrounded at the press conference by bi-partisan members of Congress and representatives of influential law enforcement and prison staff organizations. This bill has passed the House with bi-partisan support and President Trump promised to sign it when the Senate passes it and sends it to his desk. Unfortunately, these examples are just a small sample of how obsessed the Left is with their plans to destroy the Trump Presidency (RESIST and OBSTRUCT) and make America be part of their dream of a “One World Order”. As I wrote last week, it is going to be really interesting to watch the “news” from now until the November 2020 elections!